APSA offers a wide variety of sponsorship to fit every need, from lanyards to WiFi. Become a sponsor today! Wi-Fi allows attendees to access the conference mobile app, view the conference website and interactive live program, and email other attendees. Wi-Fi sponsors will be highlighted on event signs at Registration, in the program book, website, and in the mobile app. Inquire about possible password and username customization! Co-sponsorships are available! View this year’s Annual Meeting Prospectus. 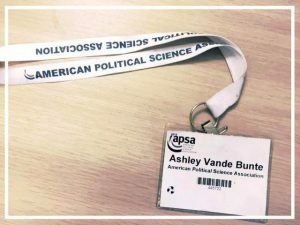 Lanyards are an effective way to do this – and also very important to APSA attendees. The lanyard will have your logo on it, and attendees will pick them up at Registration. The lanyard will be affixed to their badge so attendees will walk around during the entire conference with your logo on them! Consider a sponsorship of child care. 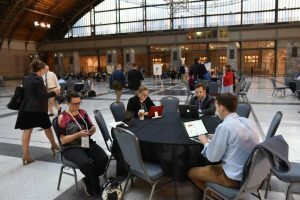 Your sponsorship will allow busy working parents to take advantage of complimentary child care, giving them the opportunity to present their research and attend sessions and networking events at the conference. Multiple sponsorships are available! Sponsor the International Attendee Reception, our international members’ biggest networking opportunity. Last year, 1,200 international attendees registered for the Annual Meeting, and this event kicks off the conference for them with hors d’oeuvres and cocktails. Co-sponsorship is available! Support the next generation of thought leaders through the Graduate Student Happy Hour. This fast-growing event is an opportunity for graduate students to network at the event. Co-sponsorship is available! View this year’s prospectus to see all available sponsorships, as well as exhibit and advertising opportunities. Have your logo and branding included in the meeting’s e-newsletter, an issue which is sent daily to all 6,500+ registered attendees. This email typically sees more than 60% open rates. Ads can be custom-tailored to specific days or events.